In this image from the NOAA Environmental Visualization Lab, the Loop Current in the center of the Gulf of Mexico is large and warm, while winter-chilled water draining the Mississippi River watershed envelop the bayous and bays of Louisiana. Image courtesy of the NOAA Environmental Visualization Lab. Download larger version (jpg, 277 KB). 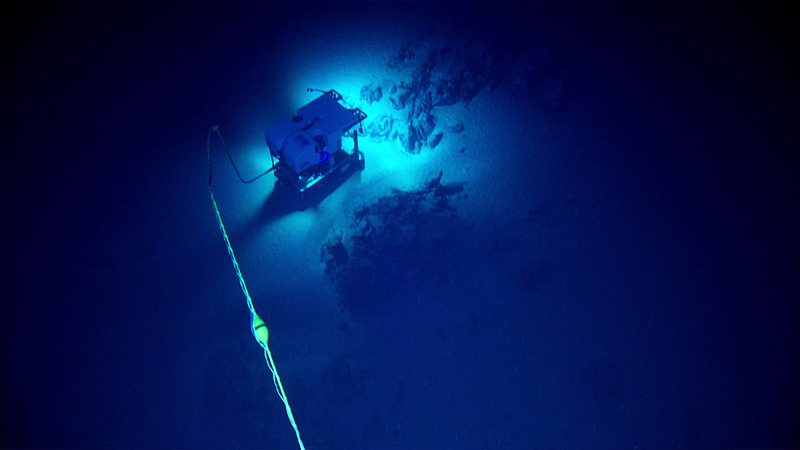 But why would a strong Loop Current affect our ability to deploy remotely operated vehicle (ROV) Deep Discoverer on some expeditions and not others? The quick answer is that, on this expedition, the Loop Current has pinched off an eddy which brought weaker currents to the escarpment region. I’ll explain more below. 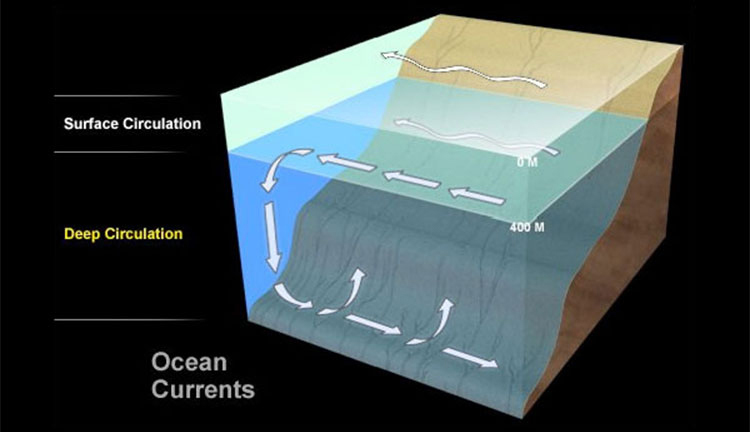 Currents are cohesive streams of seawater that circulate through the ocean. Some are short-lived and small, while others are vast flows that take centuries to complete a circuit of the globe. There are two distinct current systems in the ocean—surface circulation, which stirs a relatively thin upper layer of the sea, and deep circulation, which sweeps along the deep-sea floor. Image courtesy of the NOAA Office of Ocean Exploration and Research. Download larger version (jpg, 103 KB). But first, consider the basic difficulty of controlling two undersea vehicles (Deep Discoverer and Sirios), a ship, and the thousands of meters of heavy cable tying all three together. Each component of the system must be kept in just the right place. Working against the needed coordination are winds on the surface and currents at depths, many of which can flow in different directions at different depths. Unfavorable winds and currents can make coordination impossible. The ocean above the West Florida Escarpment is a place where unfavorable currents in the Gulf of Mexico Loop Current are often present. ROV Deep Discoverer, working in conjunction with Seirios and NOAA Ship Okeanos Explorer’s dynamic positioning system, is able to get in close to the seafloor to image large rock outcrops on Dive 14 of the expedition. Currents had prevented previous attempts to dive in this location. Image courtesy of the NOAA Office of Ocean Exploration and Research, Gulf of Mexico 2018. Download larger version (jpg, 573 KB). The Loop Current is the westernmost segment of a clockwise surface circulation known as the North Atlantic Gyre, which fills the entire North Atlantic Ocean. Winds, blowing across the ocean surface, power the circulation. The winds are driven by heat differences between the Equator and the North Pole. The Earth’s rotation causes the flow to be intensified and relatively narrow along and the continental margins of North America. 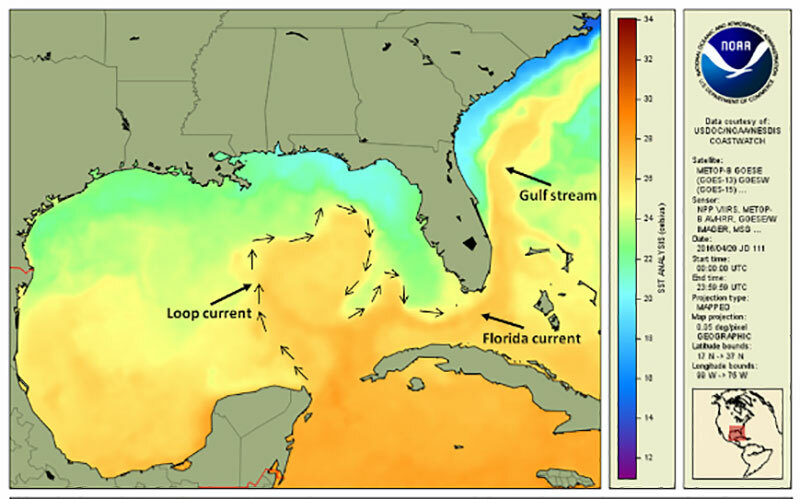 As the Loop Current flows east out of the Gulf of Mexico, the name changes to the Florida Current, and then to the Gulf Stream. The behavior of the loop as it flows into and out of the Gulf can be quite complex. Sometimes the Loop Current takes the shortest route in and out, flowing close to the north shore of Cuba and leaving the escarpment relatively free of intense currents. Other times, it extends the full north-south extent of the Gulf, sweeping across the northeastern shore before flowing south again near the Florida coast—and making ROV operations near impossible! When fully extended, the northward and southward flow can become linked creating an eddy that can persist for months. The Gulf of Mexico Loop Current on April 20, 2016, as shown by the Coast Watch GOES-POES Global Sea Surface Temperature Project. Image courtesy of NOAA. Download larger version (jpg, 183 KB). Reliable predictions have not yet been made as to how big the loop will be at a given time – and when eddies will pinch off – in spite of decades of study by oceanographers. The U.S. National Academies of Sciences is preparing now for a new strategy to attack this long-studied problem. Proposed explanations of why eddies pinch off invoke complex physics and the interaction of multiple factors. A simple way of thinking of it is that sometimes, so much water flows into the Gulf from the Caribbean that water within the loop simply cannot move fast enough to get out of the way. The loop bulges, becomes unstable, and its deformed boundaries join to form a ring, which becomes detached as the loop takes the shortcut around Cuba. The strong flow of the loop and its eddies pose problems in the Gulf of Mexico to more than just explorers and scientists. Offshore oil platforms and shipping must all adjust their activities to accommodate sudden current changes. Because of this importance, the Loop Current is closely monitored by satellites, and scientists are working hard to be able to predict its future behavior. As NOAA Ship Okeanos Explorer moves up the U.S. East Coast during the next few months, we will have to see how the Florida Current and Gulf Stream challenge the crew.